Timbakote Timber Pro is a semi-transparent waterbased acrylic stain coating that protects and enhances the natural beauty of timber. Timber Pro is a tough 100% acrylic coating designed for New Zealand’s harsh conditions offering good resistance to the effects of sun and weather. Timbakote complies and is licensed by Environmental Choice New Zealand. Timbakote Timber Pro is an ideal finish for CHH Shadowclad Ply Cladding, other exterior timber cladding, pergolas, gazebos, fences, fascias and garage doors. New timber should be clean and dry, free of any loose fibres, stains, and any stencils or other marks should be removed. It is strongly recommended that LOSP treated ply is left to evaporate the solvents for at least 7 days in the end use situation before coating. In periods of prolonged cold, wet weather or where ventilation is poor, a longer period may be required. If in doubt it is recommended to trial coat a small area of the substrate and test for satisfactory adhesion and drying. Sharp edges must be sanded, nail holes and minor defects to be filled with suitable timber filler tinted to the same colour as the timber substrate. Exposed Timber (greater then one week), remove any contamination; loose timber fibres and treat with Moss & Mould wash. Coat as per new timber. Previously oiled or stained timber: remove all poorly adhered coatings, sand and treat with a Moss & Mould wash. All sharp edges of timber must be sanded to create a rounded edge for better adhesion. All nail holes and minor defects to be filled with suitable timber filler tinted to the same colour as the timber substrate. Stir well before and during use with a flat stirrer. Apply 1 coat of Timbakote Timber Prep and 2-3 generous coats of Timbakote Timber Pro with a good quality paintbrush, applicator pad, roller or spray. If spraying, lay off with an applicator pad or brush to provide an even appearance. Do not over spread. Achieving the correct paint film thickness is important to the life of a semi- transparent coating. Apply Timbakote Timber Pro to one board at a time; lay off in long even strokes along the board’s length working to natural breaks in the cladding. Always keep a wet edge to avoid lap marking. Highly exposed aspects will require an additional coat for extra protection due to extreme weathering. Apply the final coats of Timbakote Timber Pro after the cladding has being fixed to the wall. 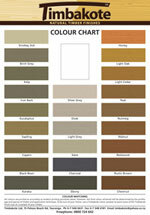 Timbakote recommends colours with an LRV of 40% plus for maximum durability. If using more then one container of Timbakote make sure all containers are mixed together prior to application. Thinning is not generally recommended, as it can be detrimental to the coating performance. The addition of 50mils of water maybe required in hot weather or when coating absorbent surfaces. If precoating Shadowclad prior to installation do not allow the sheets to be stacked together without plastic film between the sheets. Recoating should take place before deterioration of the coating allows weathering of the timber substrate to take place. A patchy, thin, faded and uneven appearance or eroded coating on edges indicates the need for recoating. Bandsawn ply and exposed timber will move with the seasonal wet and dry action of the weather. Highly exposed areas may require an additional coat after 18-36 months to maintain the coating integrity due to movement of the substrate or checking which can be exacerbated by darker colours. For this reason lighter colours are recommended by Timbakote Coatings Ltd.
A wash down on an annual basis with a Moss and Mould wash will help with the long-term maintenance of your coating. Moderately irritating to eyes - wear splash proof goggles. Flush eyes immediately with plenty of water if coating splashes to the eyes occurs. If discomfort persists seek medical attention. VOCs 6 grams per litre. Environmental Choice New Zealand approved product. Timbakote’s 5 year maintained durability statement on CHH Shadowclad Natural. If the Timbakote Timber Pro system is applied correctly on properly prepared CHH Shadowclad Natural as per label instructions it will not crack, peel or blister providing the recommended maintenance procedures are carried out and the substrate remains stable.